After the strange bugle-like sound echoed through the lush valley, the group of wild humans drop their melons and start running away from the direction of the sound. The three stunned astronauts stare at the action for a moment and then instinctively scramble to follow the fleeing mob into a tall cornfield. The humans continue to run through the cornfield until they stop abruptly to the sight of long, tall, sticks whacking and slicing, coming toward them through the cornfield. The sound of the approaching sticks makes a whistling noise as they slice through the air into the corn. The high-pitched whine of a leaf blower can also be heard as the group of humans do an about-face and run the opposite way, running headlong right into the astronauts that were following right behind them. It is the similar effect of a bumbling Jerry Lewis in a choreographed dance routine. Taylor, Landon, and Dodge see the sticks and again turn and follow the pack of humans through the cornfield just as the sound of horses hooves is heard. Suddenly, the unmistakable sound of gunshots is heard. Taylor and Dodge hit the ground immediately as dead and wounded humans fall all around them. Landon continues to stand, looking around, still casually munching on a melon, oblivious to what is going on around him. Taylor pulls him down, knocks the melon out of his hand, and slaps him on the back of the head. There's a sudden look of pained surprise on Landon's face and tears start to well up in his eyes. The three astronauts spring to their feet and scatter as the sound of the horses' hooves draws even closer. Taylor runs and dives into a thick growth of corn just as dark, menacing, uniformed figures on horses gallop by. In his little hiding place, Taylor gets a good look at the riders of the horses. He is shocked beyond belief to discover that they are APES! GORILLAS ON HORSEBACK! Taylor breathlessly watches as the first gorilla's horse comes to a sudden halt and a second trailing gorilla's horse collides into the back of the first, catapulting its rider out of the saddle and continuing to gallop off, dragging the rider, whose one boot is caught in the stirrup. STUPID APES ON HORSEBACK! Adding to Taylor's escalating horror, he looks down and realizes that he has dived into a fresh hot pile of horse manure. The humans continue to run in a panic in every direction. It is now revealed that the sticks that were cutting a swath through the corn are being handled by gorillas on foot, searching for humans. One gorilla has a terrified human cornered, threatening him with a weedeater. 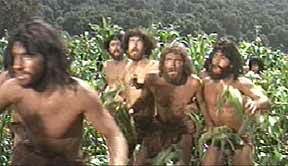 A view overhead shows that the apes are closing in on the humans in the cornfield from all directions, surrounding them. As the humans continue to run everywhere, the female that Taylor had noticed earlier has stumbled and fallen. Taylor attempts to help her back to her feet, but she pushes him away, apparently reacting to the stench of horse-poo that is radiating from him. More gunshots are heard as hidden nets spring up from the ground and entangle humans, capturing them. Taylor is being pursued by two apes on horseback with an outstretched net between them. He runs past a large ceramic yard gnome protruding from the ground that the two apes don't see in time, resulting in the shared net snagging on the gnome's pointy hat and jerking the apes off their mounts. Meanwhile, Landon is running and momentarily gets caught in a net, but escapes, giggling, into the cornfield with apes right on his heels. We see a brief glimspe of Landon's grinning face, his beard still smeared with moist melon. We now see that some humans are being chased to a dead end... a short cliff over a pond. Humans are jumping from the bluff into the water below, in a vain attempt to elude capture by the apes. One human jumps off the cliff with an open umbrella that doesn't help one bit. Landon is pursued to the edge of the cliff. He looks down at the water below and quickly turns back around, only to be smacked right in the face with a boom microphone. Landon plunges into the pond below and is dragged out of the water, unconscious, by two gorillas. The director of the film flashes an "OK" sign to Charlton Heston, who returns the gesture with a smile and a thumbs up. Cut to Dodge being chased by apes on horseback with a net. Dodge gets caught in the net and is dragged on the ground a short distance, but somehow slips out of the net. Dodge gets up and runs away as two apes take a shot at him. Dodge staggers and falls, clutching the back of his neck. He looks at the small amount of blood on his hands and realizes that the gunshot only nicked him... a flesh wound. He stands, relieved at his good luck and, out of nowhere, is immediately trampled by the horse that is still dragging its rider by the stirrup. He collapses to the ground. Moments later, Taylor stumbles over Dodge's lifeless body and discovers that his fellow astronaut is dead. Taylor gives Dodge a kiss on the cheek and whispers "Farewell, my friend. Merry Christmas." More gunshots ring out and Taylor abandons his comrade and scrambles off. grass from her mouth, she climbs out to escape, but is quickly recaptured in a net. Taylor reaches the bluff overlooking the pond. Apes are in the water below, clubbing humans with batons and rifle butts. 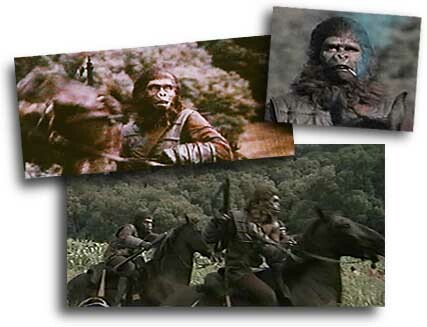 Taylor grabs a vine and starts to descend the edge of the cliff when he is shot in the neck by an ape on horseback. He grabs his throat and starts waving his arms about as he attempts to regain his balance at the edge of the cliff. He continues to do this for several moments as a few apes stand there watching him. One impatient gorilla finally rolls his eyes and give Taylor a push. Taylor falls backward into the water 20 feet below. Taylor flounders in the water, and manages to stagger and collapse at the water's edge, still clutching his neck, which is bleeding profusely. "We got us a bleeder..."
An odd quietness follows as the hunt is now over. A gorilla is carrying a young human boy on his shoulders out of the cornfield as the last echoes of the hunting horn is heard. There are glimpses of human carcasses hanging uspide down on a rack and dead humans slung across horses' backs like deer on the fender of a pickup truck. Apes are carrying human corpses over their shoulders and depositing them in growing heaps of bodies on the ground. Horsedrawn wagons of captured humans drive by as we see Taylor being carried by two apes. He is strung upside down to a pole by his wrists and ankles and loaded on his back into a straw covered wagon. He looks up to see other humans looking down at him, sniffing him with a disgusted look on their faces. Taylor looks away and observes three gorillas smoking cigarettes and posing for a photograph by a photographer manning (or should I say aping... heh, heh... oh, never mind) an old-fashioned camera on a tripod. At their feet are their trophies of the hunt... a pile of human bodies. The photographer yells "Smile!" (.aif 68k) and the three gorillas laugh and chuckle, followed by a bright flash from the powder of the photographer's flash tray. This incredible scene is too much for Taylor to bear. Just before he passes out, he realizes that not only has he landed on a bizarre world where rifle wielding apes on horseback hunt wild humans for sport, but the apes smoke! "Girl, you know it's true..."